Harry Potter is lucky to reach the age of thirteen, since he has survived the murderous attacks of the feared Dark Lord on more than one occasion. His hopes for a quiet school term concentrating on Quidditch are dashed, though, when a maniacal mass- murderer escapes from Azkaban, pursued by the soul-sucking Dementors who guard the prison. I love the harry potter series. I've watched the movies but never read them so I​ decided to buy them. 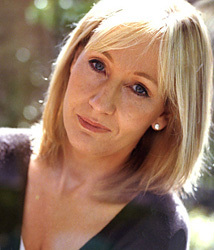 J K (Joanne Kathleen) Rowling was born in July 1965 at Yate General Hospital in England and grew up in Chepstow, Gwent where she went to Wyedean Comprehensive. Jo left Chepstow for Exeter University, where she earned a French and Classics degree, her course including one year in Paris. As a postgraduate she moved to London and worked as a researcher at Amnesty International among other jobs. She started writing the Harry Potter series during a delayed Manchester to London King's Cross train journey, and during the next five years, outlined the plots for each book and began writing the first novel. Jo then moved to northern Portugal, where she taught English as a foreign language. She married in October 1992 and gave birth to a daughter Jessica in 1993. When the marriage ended, she and Jessica returned to the UK to live in Edinburgh, where Harry Potter & the Philosopher's Stone was eventually completed. Jo married Dr. Neil Murray in 2001, and a brother for Jessica, David, was born in 2003. A sister, Mackenzie, followed in 2005.